Readers Question: What is the cause for the decline in house prices, during a recession ? Economic recession / high unemployment (reducing demand and causing home repossessions). Fall in bank lending and fall in availability of mortgages (making it difficult to buy). Fall in confidence / expectations of future house prices. An excess of supply in the housing market. Correction of house price to incomes ratios. Preceding the recessions, house prices had risen much faster than inflation and wages. It meant in the preceding years, house price to incomes ratios had increased. The recession caused a ‘correction’ in these house price to incomes ratios. For example, in the boom years, buy to let landlords may buy houses to try and make capital gains. But, in a recession, sell because house prices are falling. It is worth noting that the fall in UK house prices has been quite mild compared to other countries. For example, Ireland has seen a real collapse in house prices. The Irish house price collapse follows a similar pattern to the UK – banking crisis causing a shortage of finance. Recession causing unemployment and falling demand. However, in addition, Ireland had a real boom in house building in the preceding years. Therefore, with falling demand, Ireland, Spain and US have had a bigger excess of supply. Therefore, house prices have fallen more in these countries, than the UK. UK house prices have been insulated by this shortage of supply – which has kept prices higher than if supply was more elastic. 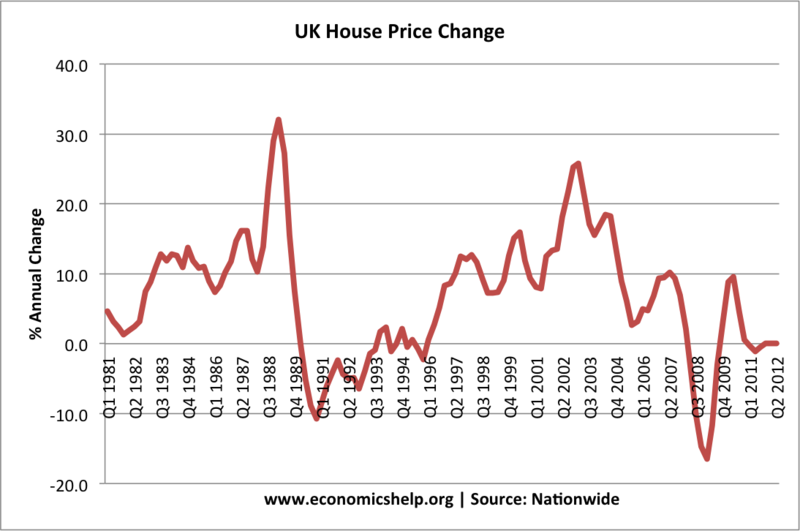 If we look at graph of UK house price affordability. There has only been a very small improvement in affordability of houses. The ratio of house price to incomes is still greater than early 1990s, suggesting certain factors have prevented a bigger than expected fall in UK house prices. Why have UK house prices stopped falling?